We are proud to present you with your unique Hilton Bespoke suit. While the perfect fit and the durability of your newly-acquired gem will speak for itself, allow us to expand on some of the effort that has gone into the work of art you helped us create. After all, selecting the world’s finest fabrics is only half the job done. The true quality of your garment shows in the other half: In every minuscule detail that our craftsmen have included in the construction of your one-of-a-kind suit. These details are as subtle as they are significant, so let us take a closer look at each one. The most time-intensive stitching goes to waste the moment a seam opens due to poor quality thread. At Hilton Bespoke, we therefore pride ourselves in using internationally renowned hreads from the United Kingdom and Germany. This is our way to ensure the beauty of our stitching is preserved, and our customers are able to rely on their suit year after year. Beautiful lining is a fashion statement all on its own. But it’s not just the looks that count - synthetic lining used in a suit made of wool or cotton negates the wonderful qualities f the natural fibers. Therefore, Hilton Bespoke follows the lead of high-end fashion houses and prefers Bemberg Cupro lining: A unique, breathable material that wicks moisture away from the skin. In addition to its cooling properties, Bemberg is anti-cling and anti-static, making it more comfortable to wear than any synthetic counterpart often found in suits today. Piping is a purely decorative element, which can lend an interesting touch to your suit. Whether you prefer a stark contrast with a bold color or a subtle trim, our hand-selected piping is the perfect meeting point for our fine suit fabrics and top-quality lining. And, as everything else in your Hilton Bespoke garment, it is an expression of your personal style. For the sleeves, we give you the choice of regular cuffs or Surgeon cuffs. If you like creating contrast with colour, our craftsmen will meticulously construct each buttonhole with a coloured thread of your choice. This will add another element of distinction to your unique garment. The most time-intensive stitching goes to waste the moment a seam opens due to poor quality thread. At Hilton Bespoke, we therefore pride ourselves in using internationally renowned threads from the United Kingdom and Germany. This is our way to ensure the beauty of our stitching is preserved, and our customers are able to rely on their suit year after year. In accordance with every other component of your Hilton Bespoke suit, the buttons are top-of-the-line products which are imported from Italy and the United Kingdom. We prefer buttons made of bamboo for their durability and versatility, and offer a wide range of styles to ensure you wear the suit you envision. Sweat shields are a hidden and very useful feature, especially in warmer climates. They serve to protect the outer suit fabric from perspiration and odour, and when made of a moisture-wicking fabric like our Bemberg Cupro lining, they are an indispensable element to increase your level of comfort along with the lifespan of your suit. Our craftsmen take pride in their work, and Hilton Bespoke’s handpicked stitching is an excellent opportunity for them to demonstrate their expertise. This distinctive line of skillfully stitched thread runs along the edges of your jacket and adds to the well-crafted appearance of your garment. 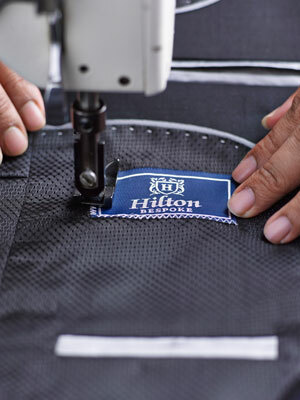 When you see the Hilton Bespoke Label in a suit, you can rest assured that the utmost effort has been made to craft a unique, durable, highly personalized garment unlike anything that is offered elsewhere. 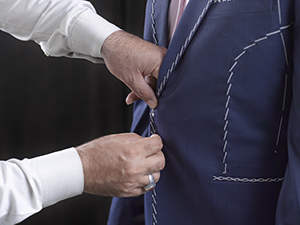 The smallest details have been included in the construction of your suit, using the very best materials available along with the most intricate tailoring techniques. The result is a fine piece of clothing that will henceforth express your unique style and your penchant for the distinguished things in life. Wearing a Hilton Bespoke suit is a powerful statement you make not only to others, but also to yourself, knowing you have chosen the finest tailors and are clothed in the highest quality materials. Once you experience the unparalleled comfort of a Hilton Bespoke suit, it will undoubtably become your absolute favorite. We thank you for your choosing Hilton Bespoke Tailoring, and we look forward to serving you again in the future.